14K Gold Box Chains may just be the most versatile piece of jewelry any man or woman can own. 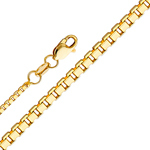 Gold box chains are expertly crafted from the highest quality 14-karat gold, with design integrity that is unparalleled. The next time you are looking for the perfect gift for a special person in your life, or a little something to treat yourself, you'll find the perfect selection of box gold chains. Whether worn alone or in multiples, gold box chains for make a delectable fashion statement. We offer a selection of box gold chains in numerous widths, lengths, and designs and suitable for any occasion. Give your gold box chain a custom touch by choosing from any of our exceptional Personalized Gold Nameplates, Gold Charms or Gold Pendants. With a level of comfort and style that cannot be matched Box Chains add an attractive touch to casual and formal attire.